We don’t know what the successor to the 2014 Shelby GT500 Mustang will be called and while plenty of rumors have been floating around about the high performance trimline for the 2015 Ford Mustang about what it could be called – this video almost certainly shows that mystery Mustang in action. Whether it retains the GT500 name or adopts the Gt350 name or reverts back to the SVT Cobra name that was last used for the “Terminator” Mustang back in 2004, we know that it is going to be more powerful and faster than the standard Mustang GT. One thing that we can most assuredly expect from the 2015 Shelby/SVT Ford Mustang is that it will have a big, loud exhaust system and an exhaust system of that nature is what makes us (and everyone else) believe that the video below shows the next Shelby or SVT Mustang out on the open road. Best of all, this video of the 2015 Ford Mustang SVT or Shelby model isnt a 15 second clip shot through the closed window of a passing car – this video shows some 3 minutes of the next generation super-Stang in a variety of motoring situations. 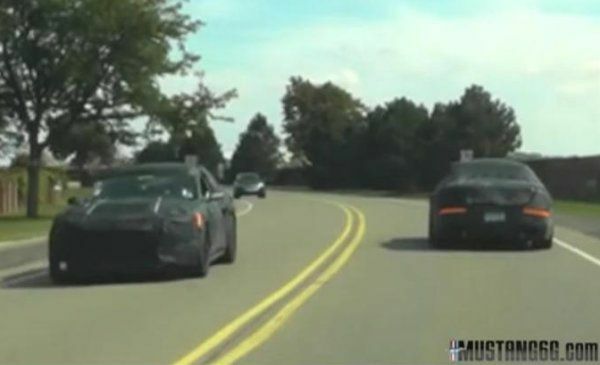 Most notably, this video offers several short clips of the 2015 Mustang SVT/Shelby model accelerating hard, revving the engine while stopped and cruising around the greater Detroit metro area. At the 1:27 mark, while the cameraman is following one GT350/SVT Cobra, what appears to be another super-Stang test mule passes in the other direction and that mule has what appears to be a big, bulging hood with slots in the camo that would indicate a hood-mounted air intake (as shown in the screenshot above). There have been rumors that the 2015 Mustang will feature some style of hood scoop and the Mustang mule that passes about a third of the way through the video would lead us to believe that at least one of the 2015 Ford Mustang models will indeed pack a big hood scoop or air intake or some sort. While the quad exhaust tips would suggest that the 2015 Ford Mustang mule(s) being followed around in this video are some higher performance package than the standard Mustang GT, the fact that this test car is so extremely loud is another clue that this is not an “average” Mustang. This test car seems to be much, much louder than any production Mustang GT but the decibel level seems to be in line with what we have seen (and heard) from the likes of the Shelby GT500 and perhaps the Boss 302 Mustang. Needless to say, any factory built Mustang that sounds as awesome as this one will resonate very well with the high performance consumer market – but even if the next generation high performance Mustang sounded exactly like the current GT, Im sure that it will sell just fine. I should clearly state for the record that TorqueNews.com is in no way involved with the folks from Mustang6g but in my years of following the automotive industry, I don’t think that I’ve seen a single enthusiast website that has done such a masterful job of stalking an upcoming model. Mustang6g has had it all – from spyshots to spy videos (like this one) to amazing artist’s renderings of the 2015 Ford Mustang and this group deserves to be commended for their amazing diligence. Many people expect that the next generation Mustang – dubbed the S550 platform – will debut at the 2014 New York International Auto Show which will allow the Motor Company to introduce the 2015 Mustang exactly 50 years after the very first Mustang was introduced at the 1964 New York World’s Fair. With the 2014 NYIAS some seven months away, we could see a great many more spy images and videos before we have seen the real thing in the flesh.